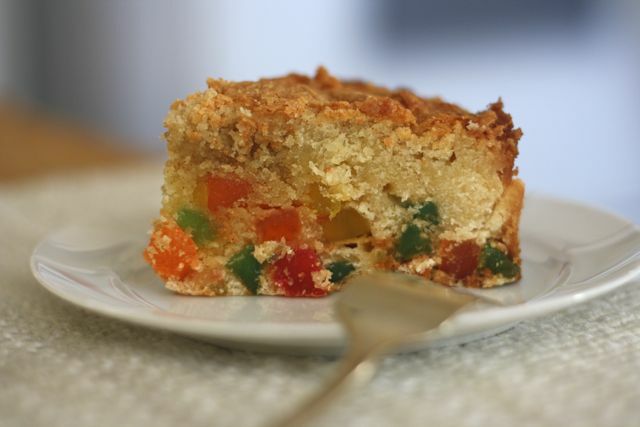 Last night, I dreamed of gumdrop cake. I saw a slice of cake, close up. It was white and fluffy and the gumdrops were perfectly distributed throughout the cake – you know, almost suspended in the air of the cake. It was a beautiful thing. In fact, if you make this cake with regular wheat flour, that dream can be your reality. 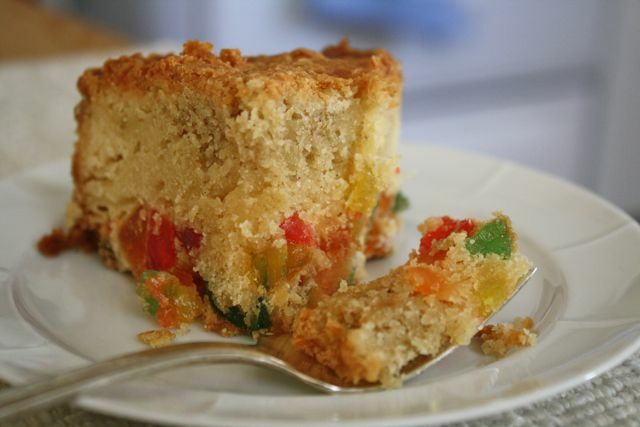 If you make this cake with gluten-free flours, your pretty gumdrops will drop (ooh, foreshadowing!) to the bottom half of the cake and give you a gumdrop layer cake. I have given this a great deal of thought today and I believe that, according to the laws of physics, that is just the way things are meant to be. I mean, with no gluten to hold up the gumdrops in the cake, what can they do but drop? Anyway, all that to say: it doesn't matter! Because whether you have gumdrop studded cake or gumdrop layer cake, you still end up with a rich, buttery cake that is just right for celebrating. Yes, this little blog is turning two and I thought rainbow gumdrops were appropriate for celebrating this toddler achievement. I am also celebrating with a new plum and star anise header and – coming very soon – a print button so you can quick-as-a-snap print just the recipe you want. You might say, "Stephanie, my goodness, two years! You have posted 84 recipes in that time! What are your favourites?" Or maybe you wouldn't say that at all and you would like me to get back to the gumdrop cake, please. Certainly. I first tried this cake days – days, I tell you! – after New Year's when I was visiting Angela in Halifax many years ago. Her mom had sent this cake home with her after Christmas. I had never eaten gumdrop cake before and I was entranced. I do believe I ate a small slice every day of the four or five days I visited. 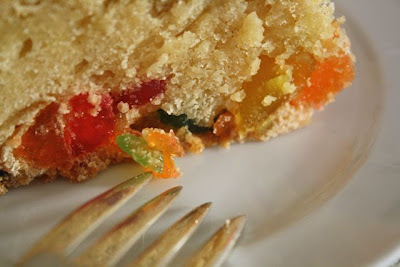 The cake was dense and soft, and the chewy gumdrops provided pockets of chewy, gummy love. After all, it's birthday cake. It should have lots of butter and milk and sugar – and gumdrops. If you'd like to scale the recipe down to half – which I highly recommend if there is only one or two of you in the house – use a 6-inch pan and bake for about one hour and 15 minutes. If you use an 8-inch or 9-inch pan with half a recipe, bake for about 35 minutes. 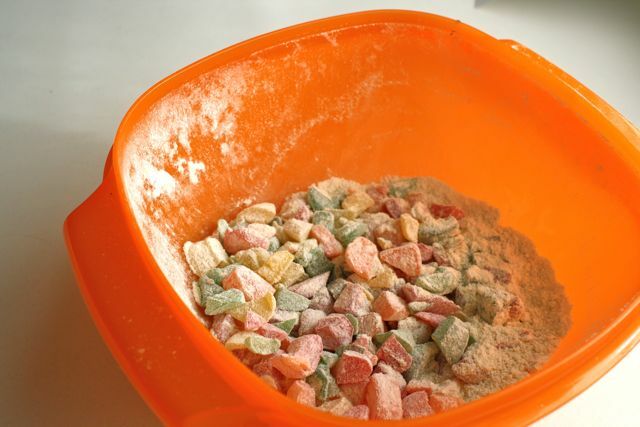 Cut gumdrops into thirds and sprinkle with 1 cup of the flour. Cover them, and leave them to sit on the counter overnight. When you're ready to start baking, preheat the oven to 325 degrees Fahrenheit. Butter a tube pan. Dust with flour. Beat the butter, eggs, sugar and vanilla together until somewhat fluffy. Set aside. In a separate bowl, mix the flour(s), baking powder and salt together well. Alternately add the milk and the dry ingredients to the butter mixture. Fold in gum drops. Pour batter into prepared pan. Bake for 1 1/2 hours, or until golden brown and your cake tester comes out clean. Let cool fully before eating. Keeps well in a sealed container on the counter for quite a while. * Use regular gumdrops or jujubes, not the baking ones. Take out any that are black or clove-flavoured. Happy 2nd birthday dollop of cream---to many more food filled years to come! Hi Stephanie - congratulations on turning two!